The Vickers was a water-cooled machine gun, and, while it's tough to see in the photos, the model even includes a little pewter hose to connect the gun's barrel to a water can placed beneath it. Next, the second squad of NNHS troops. 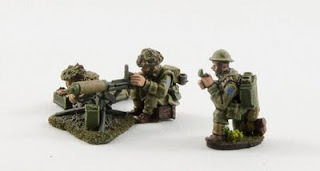 I added a couple of options to this squad that I left out of the previous one, namely one soldier is carrying a PIAT, and another has a 2-inch mortar strapped to his backpack. 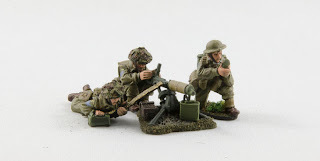 I have enough pieces left on my sprues to build a light mortar team, so I'm sure there's one of those in my future as well, but for now they are just packing it. I'm still very happy with the Bolt Action plastic figures. Now I just need to get them on the table! !